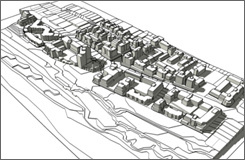 Because the urban environment exists in three dimensions, mackay urbandesign uses 3D computer modelling to plan and design built environments. In some cases the model consists of building envelopes that architects can subsequently use their creativity to design within. In other cases, the model consists of particular building typologies, such as house types, that establish a much higher level of control over what is subsequently built. 3D structure planning for the Scarborough Beach SEAS project. 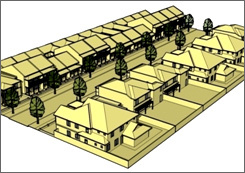 3D SketchUp models using specific house types as the building blocks of new residential streets. 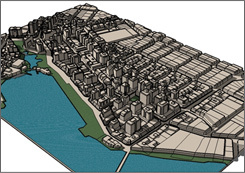 3D structure planning for the future growth of the Mandurah Central Business District.